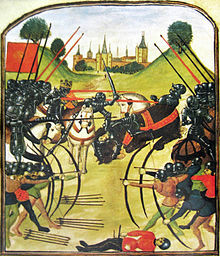 The Wars of the Roses (1455–1489) were a series of civil wars fought over the throne of England between adherents of the House of Lancaster and the House of York. Both houses were branches of the Plantagenet royal house, tracing descent from King Edward III. I know of no one in the realm who would not more fitly to come to me than I to him. Richard Plantagenet, Duke of York when asked in Parliament if he would be willing to appear before the Lancastrian King Henry VI, 10 October 1460, quoted in The Encarta Book of Quotations, 2000. By God's blood, thy father slew mine, and so will I do thee and all thy kin. Sir Thomas Malory at the end of the chapter The Tale of King Arthur of his larger work, written circa 1468-1470 while held in Newgate Prison as a captured partisan of the rebellious Earl of Warwick. Reprinted in Malory Works, edited by Eugene Vinaver, 1954. This page was last edited on 17 April 2018, at 16:00.